Last year I made this Easter Bunny card. 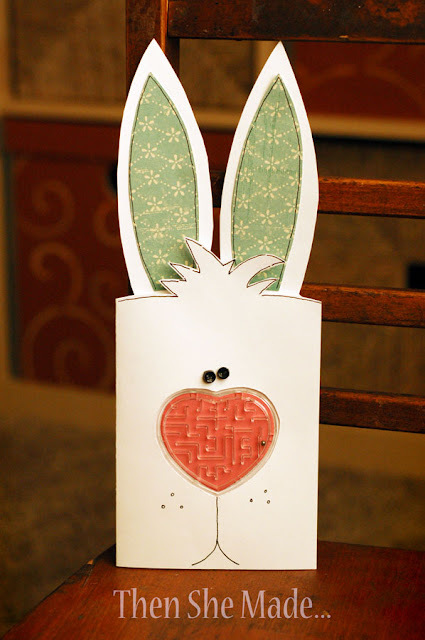 I did a quick tutorial on it, which you can see here: Easter Card and that was that. However, since Easter is coming up in March the activity on Pinterest for this card has picked up and I'm getting several e-mails from people asking me where they can buy the heart shaped mazes. I bought mine at Walmart but they were a seasonal item leftover from Valentine's day. So, do any of my dear readers know of a source either locally where you are, or online, that people can buy them? Oriental Trading Company..72 for a small fee. I bought them through Oriental Trading when I made your Valentine Cards last month! $7.25/ 6 dozen. Great Deal!